Are you having a new kitchen and long for something different? we all try to be different and strive to make our home as unique as possible. Have you ever considered natural edge worktops as a stunning addition to your kitchen? We are blessed with some amazing hardwoods at our disposal, all of which are home grown many within 50 miles of our workshop, timber that has stood for many hundreds of years. Trees have seen history unfold around it, world wars, extremes of weather, and if they could talk many secrets would be unfolded under their canopy’s. 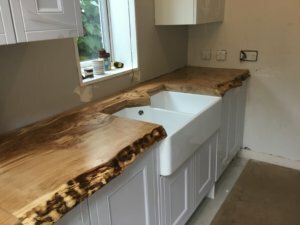 We can produce and install these stunning slices of English hard woods in to your kitchen as single width worktops, once finished these worktops are extremely hard wearing and will add a touch of magic to your kitchen, or maybe you would like to install a natural edge central island as a feature. We are lucky enough to be able to even supply a matching kitchen table, we can source the same timber so all will be from the same tree and all matching. As all our timber comes from managed woodland we know it’s providence, so you can have a truly unique worktop. Made with the knowledge that it’s not illegally sourced and where it stood, we can also estimate the the age of the tree. Look no further, dismiss those Formica worktops, or the corian surface, or even the cold granite, choose a slice of magical English hard wood for your waney edge kitchen worktops. 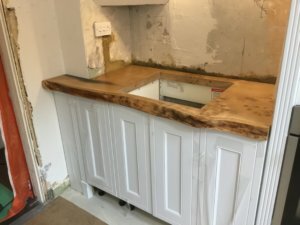 We also offer a personal kitchen template service so all the work is carried out in our workshop, this way minimum disruption is caused, as we simply install finished waney edge kitchen worktops in to your new kitchen. please feel free to contact us for and help and advice.